Update to Spotify Android app adds 320kbps sound | What Hi-Fi? Spotify has released an update to its Android app, unveiling a whole new design, upgraded 320kbps music quality, Last.fm scrobbling and more. The new look app is a free update available now via the Google Play store (formerly the Android Market). As well as the design overhaul, the Spotify app offers full support for Android 4.0 and crucially brings what Spotify calls 'extreme' sound aka 320kbps to the Android mobile experience. Music artwork is now in high resolution, related artists comes to mobile for the first time and there's a new navigation interface. Last.fm integration, already on the iOS app, is now on Android too, while crossfade and gapless playback have also made the jump. With bug fixes and the promise will be slicker and much faster, it sounds like an all round improved Spotify experiece on Android. 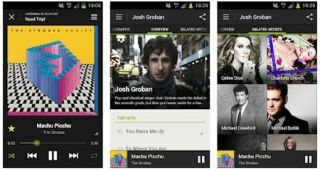 The new Spotify Android app is available now to download from the Google Play store.